We are providing our clients with Metal Water Stop Seal, which is used for heavy structures, where joints are protected. Due to the ductile nature of Metal Water Stop Seal, our product is the most suited material for this purpose. Besides, various shapes of the Metal Water Stop Seal have made it extensively popular in the market. 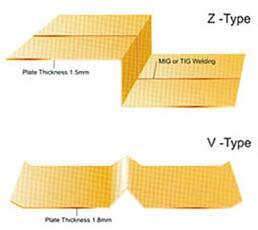 Shape either in the thickness of 1.5 mm or 1.8 mm.